Why is the Child’s Voice important? What Children and Young People have told us? How much do young people need to be involved? the reasons behind engaging them in discussions, and related strategic priorities. The WSCB wants to capture the voice and experiences of young people who have received an intervention from children’s services and to evidence improved outcomes. A consultation questionnaire has been developed with the Participation and Engagement Service which can be used just before closure or shortly after to provide young people with an opportunity to share their experience. 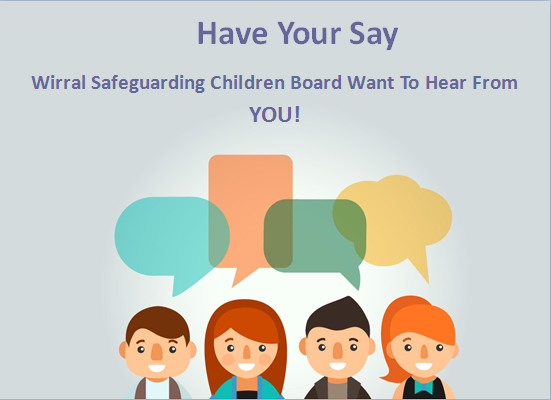 Responses from young people will be collated, scrutinised and reported back to the WSCB. The flyer includes a link for young people to follow which will direct them to a short survey with some short questions about their experience of services and if anything could have been done better.